Supreme Court nominee cites cases when justices ruled against president who appointed them; he also calls Roe v. Wade ‘settled law’. 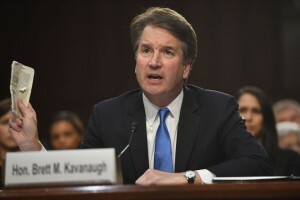 Supreme Court nominee Brett Kavanaugh faced sharp questions Wednesday on his positions on abortion rights, gun regulations and the president’s pardon power as the pivotal segment of his confirmation hearing unfolded before the Senate Judiciary Committee. Judge Kavanaugh gave no hint how he might rule, following the longstanding nominee playbook that calls for avoiding questions about issues that could come before the Supreme Court. But he sought to reassure senators that however he may resolve a case, he believed the losers should feel they got a fair hearing and the public should know that he understands the consequences of the power he would wield. “I don’t live in a bubble. I live in the real world,” he said.